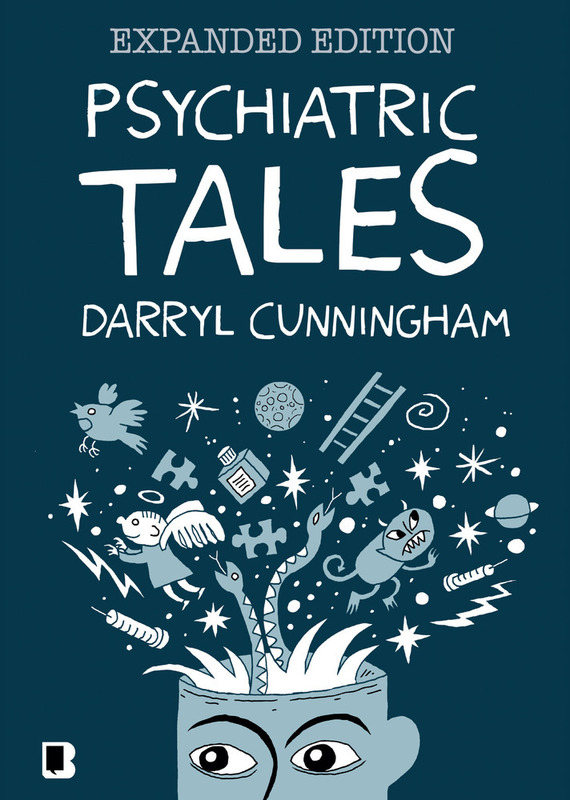 Over the last few years Darryl Cunningham has established himself as one of the most vital and important voices in British comics. 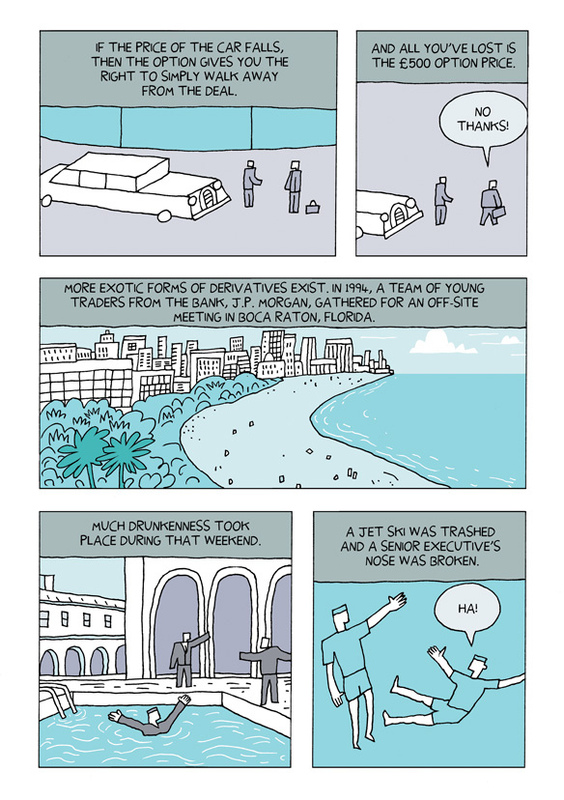 As recognition of the power of the comic strip form to effectively communicate relatively intricate issues continues to grow, it’s creators of Cunningham’s calibre who are at the forefront of the resurgence of graphic journalism as an accepted form of reportage. 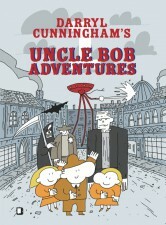 Cunningham is a notably versatile artist whose comics have ranged from the all-ages fun of the Uncle Bob Adventures to the topical myth-busting of Science Tales, and his breakout book Psychiatric Tales is undoubtedly one of the pivotal works in the rise of graphic medicine in the UK over the last ten years. 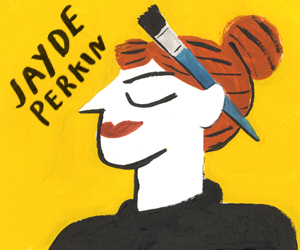 BROKEN FRONTIER: For potential new devotees of your work could you fill us in on your journey into comics from the early days of posting strips online through to today? DARRYL CUNNINGHAM: Way before there was an internet, I was involved in the British small-press comic scene in the early 90s. I produced a few self-published comics and contributed to anthologies such as Fast Fiction, Dead Trees, and Turn. 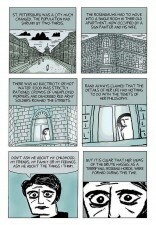 I wrote a two-part strip which Jonathan Edwards illustrated that appeared in Deadline. 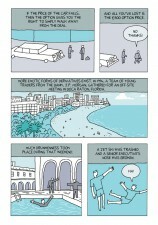 I collaborated with Simon Gane on a noir thriller called Meet John Dark which Slab Of Concrete published. I had a back-up strip in in an issue of Dave Sim’s Cerebus (Dave Sim was an early champion of mine). So a lot was happening, and then nothing. This early success never developed into anything I could make a living with. Comics were fashionable for a while in the mid-90s, but this interest by publishers faded away, leaving people like me with nowhere to go. So I left comics and struggled instead to build a career in mental health. I worked as a nursing assistant on an acute psychiatric ward for years and eventually decided to do my training as mental health nurse. About two years into the three year course I decided that I could not go on. I was completely burned out and was suffering from depression and anxiety. A rather terrible experience as I’d invested so much time and effort into this course. Eventually I dragged myself out of the pit of depression. All through the time I’d been working on the wards I’d been keeping a diary, with a vague idea that the material would make a book someday. I began to draw up these events into comic strips, posting them online on my blog, and on Open Diary, and LiveJournal. 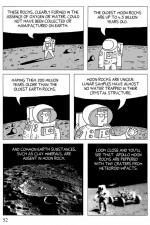 These black and white strips got a huge response – thousands of views and hundreds of comments. 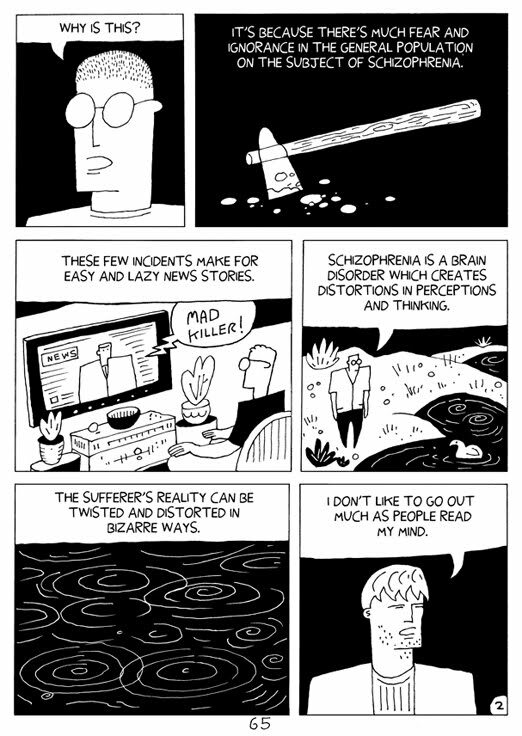 The strips look at common mental illnesses like depression, bipolar disorder, and schizophrenia, and attempt to explain and destigmatise them. There is a lot of misunderstanding about these subjects and I wanted to set out the facts. 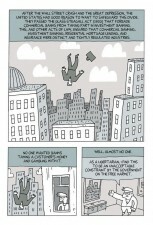 So that’s how my second life as a comic book creator began. 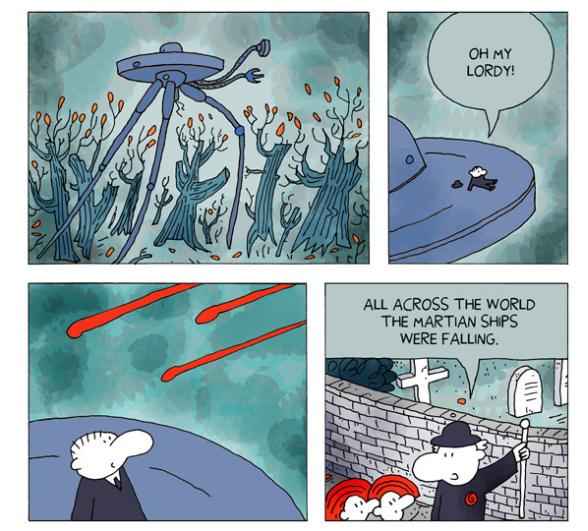 There was so much interest in these strips that publishers came to me. Blank Slate published Psychiatric Tales in the UK and Bloomsbury published it in the US and Canada. There have since been French and Korean editions. 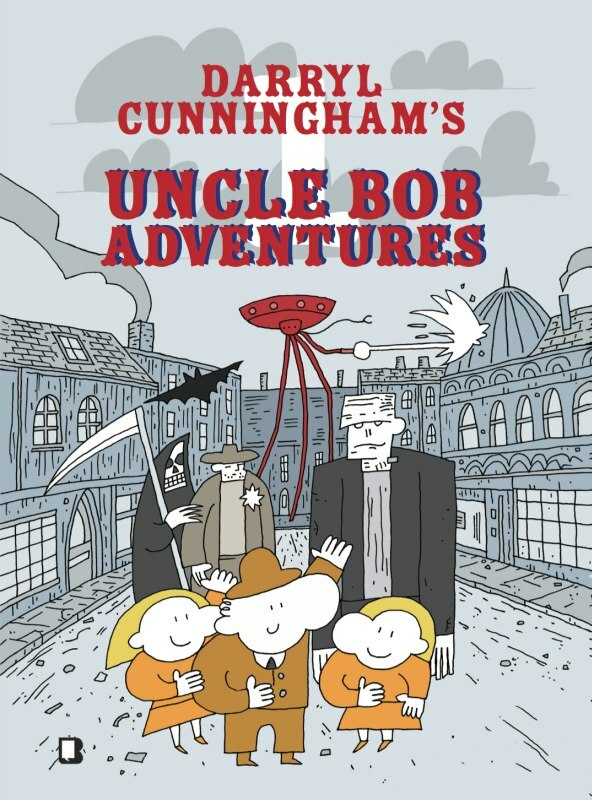 Since then I’ve done Uncle Bob Adventures for Blank Slate – a two volume all-ages collection of strips that tells stories from the life of a 150-year-old man. These books are a trawl through lots of my favourite genres. There’s a Western story, a Victorian crime thriller, and a jungle adventure. Along the way, Bob meets the Frankenstein monster, dinosaurs, Martian tripods, and takes a trip to the Earth’s core. What more does anyone want? 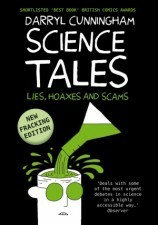 Science Tales, published by Myriad Editions, is a book of comic strip essays on controversial science subjects. 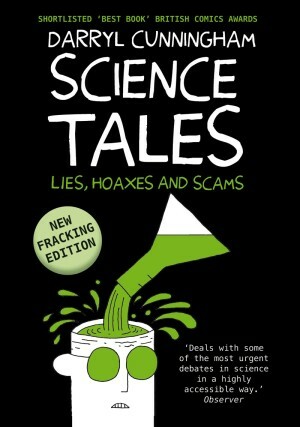 These include evolution, gas fracking, the MMR vaccine controversy, chiropractic, homeopathy, climate change, and a look at the belief that the NASA Moon landings were faked? (hint – they weren’t). 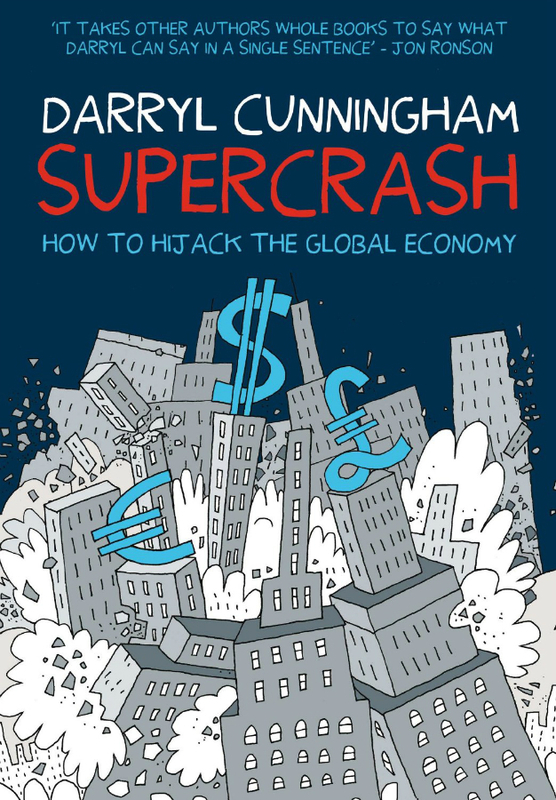 Supercrash: How to Hijack the Global Economy is your latest book published by Myriad Editions this autumn. Can you give us a short overview of the book’s three sections and how they tie together as a greater whole? I begin the book with a biography of the Russian born writer Ayn Rand, showing her influence on the political right in the US. Back in the Fifties, right wing ideologues like Rand, with their devotion to free-markets and deregulation were on the fringes of politics, but gradually these ideas have grown to dominate the world. 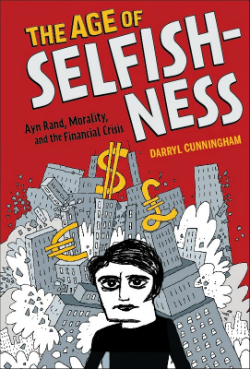 Rand promoted the philosophy of Objectivism, which views selfishness as a virtue and altruism as a moral weakness. It’s an upside down philosophy which horrifies me, but which is useful if you’re the sort of person who is happy to trample over others to make your riches. 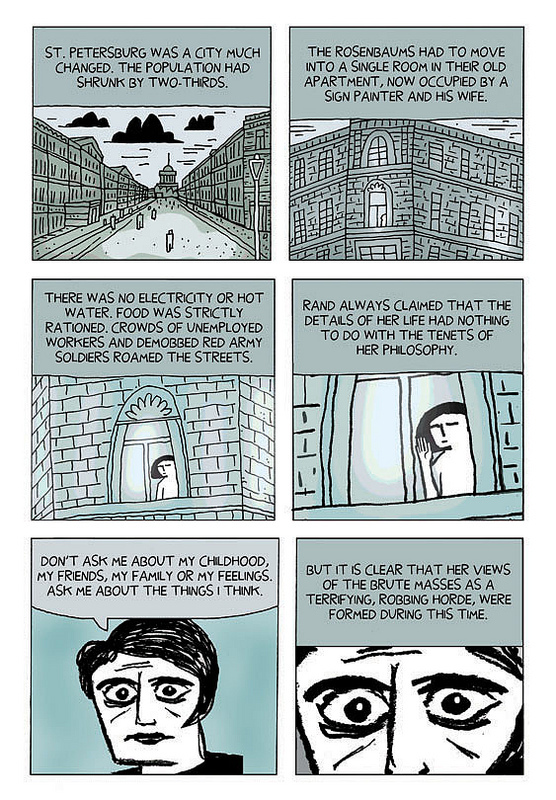 Rand hated communism, because of her experiences in post-revolution Russia, and saw any kind of intervention by the state as a step towards a totalitarian regime. In her view Government was the enemy and its role in people’s lives should be reduced to almost nothing. Big business should take over most aspects of the state with the exception of the police and the military. Both taxation and welfare should be abolished. All this may sound familiar to you and that’s because it’s increasingly the world we live in. I also look at Ayn Rand’s influence on Alan Greenspan, who was head of the US Federal Reserve bank in the US, from the Reagan years up until shortly before the 2008 financial crash. Rand was Greenspan’s mentor and we have his zero-touch regulation of the US mortgage industry, inspired by her, to blame for the catastrophic events of 2008. 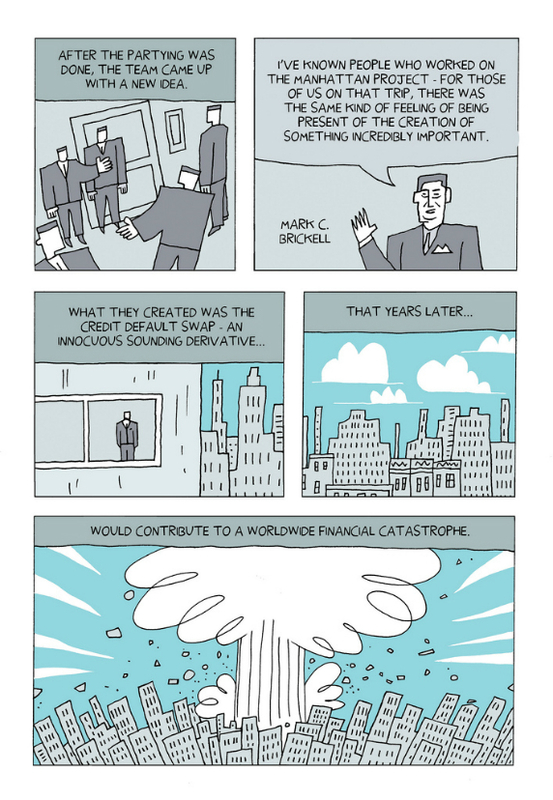 In part two I look at how the collapse of the US housing bubble brought about the banking crisis, who was to blame, and how they got away with it. 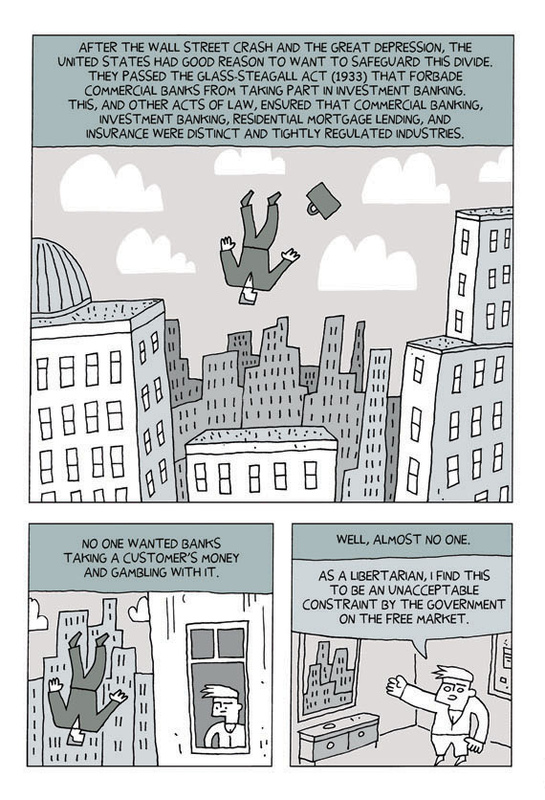 The media has generally done a poor job of explaining the intricacies of the financial sector to those who have been most affected by the consequences of the crisis. So one of my motives in writing this book was to explain some of this stuff. What are options, futures, bonds, credit default swops, and collateralised debt obligations? I lay out the whole sorry tale, from the fraudulent mortgages sold in their millions, to the eventual bailout with taxpayers’ money. 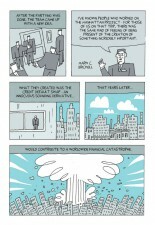 Part three is a summary of where we are now, post-crisis. 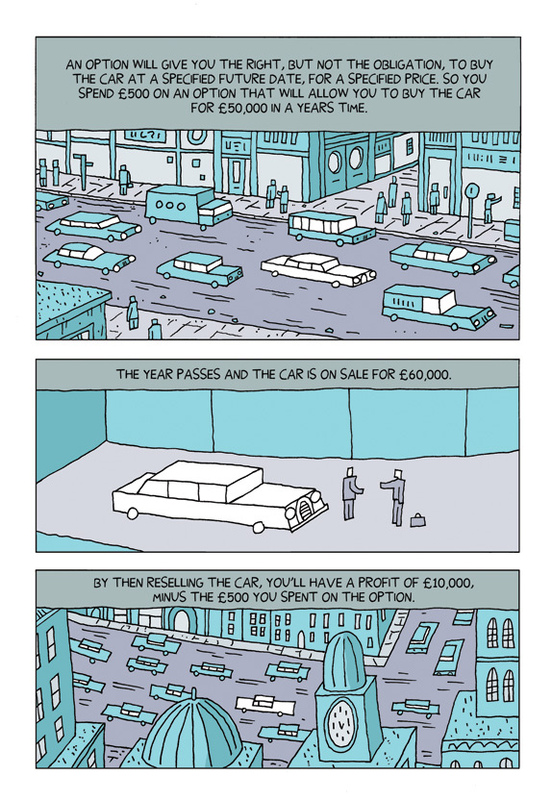 How the richest one percent of the population, along with multinational corporations have restructured society to serve their interests, creating a new gilded age for the super rich. There is a section on the psychological differences between conservatives and liberals. Both left and right have a very different concept of fairness and this naturally leads to different political outcomes. Liberals believe in equality for all, while conservatives believe in proportionality – that you should only get from society what as you put into it. This is where the right’s fear of the freeloader comes from. I also cover the damaging effects of the Government’s austerity measures on vulnerable groups – such as the rise in the use of food banks for the unemployed and low-paid working people. 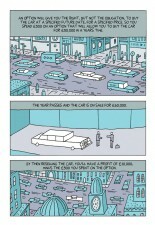 All aspects of the colossal transfer of wealth that’s taking place from the bottom of society to the top. What inspired you to try and unravel the intricacies of such a convoluted chain of events in Supercrash and what do you hope readers take away from the book? It seemed to me to be the subject that defines our times, and as such, I had to tackle it. I hope readers will take from the book a better understanding of economics and a widescreen view of how unjust and unfair our society has become. 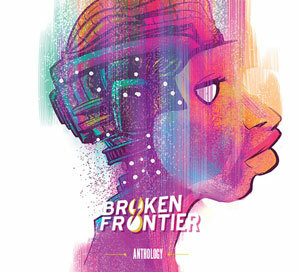 Your ability to break down complex issues into easily digestible and compelling narratives without ever compromising the points you make is something I have remarked on in the past here at Broken Frontier. 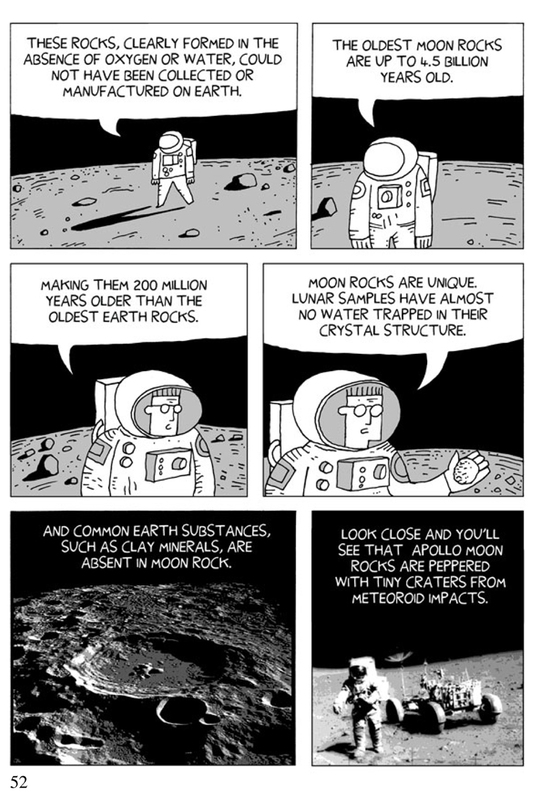 What is it about comics as a medium that makes them such an engaging format for effectively communicating relatively involved subject matter? It seems very natural for me to do that way. I’m a writer and an artist so it makes sense for me to use both the talents I’ve got at my disposal. I don’t know that comics are better for effective communication, as not everyone gets it, but I do know its pleasure for me. If you can get past the barrier of thinking comics as a medium fit only for children, then you have a whole world you can immerse yourself in. Words and pictures are powerful on their own. Together they’re unbeatable. Are there difficulties when approaching a subject like, for example, the politics of Ayn Rand in maintaining your objectivity, given the extremism of her beliefs? And, conversely, were there any points in that investigative process where you found your own preconceptions or existing viewpoints on the topics of the book being challenged? I’m not interested in writing a balanced view showing both sides of an issue as equal. I want to show the truth, and if that means one side of the argument is portrayed as wrong, then that’s how it should be. As for whether I discovered anything that challenged my own beliefs – well there’s some evidence that despite all the fine things that liberalism has brought us, such as equal rights for women, minorities, and gays, there is a dark side too. The loosening of the social ties of family life, religion, and automatic deference to authority that took place in the 1960s, also helped create the huge crime wave that ran on into the mid-90s. Something ugly was let loose that previously had been kept in check. I found this information disturbing. There’s an argument from the political right that liberals cause crime, which previously I’d dismissed as idiotic, but there may be something to it. My conclusion is that there are aspects of conservatism that society needs as a check on rapid change and random chaos, but it shouldn’t be allowed to stop all progress. We need a balance of conservative and liberal policies if we want a just and stable society. It can’t all be one side or the other. Given that Supercrash must have been an incredibly time-consuming project in terms of research can I ask about the number of revisions a book like this goes through in comparison to your other work? The first two sections weren’t too difficult to structure, because they both followed distinct timelines. I merely related events as they happened. It was with the third section where I ran into problems. I had to do a lot of restructuring, swapping sections around in order to make the argument flow better. I worked closely with my editor, Corinne Pearlman, on this section. I was also asked by my publisher to add material in order to strengthen the book. There’s a whole section about the American Tea Party political movement that was added very late in the book’s creation at the request of Abrams, my US publisher. I’ve never worked so hard on researching and revising a book as I did with this one. I had a fair bit of expert help, especially on the complexities of the finance section. There’s always been a quiet passion, perhaps even a sense of subdued anger, to much of your material – either a desire to debunk the dangerous or the foolish, or a determination to bring inequality to light. How much is your work motivated by a sense of social justice? My anger isn’t subdued at all. A sense of social justice does motivate much of my work, but I also keep an eye out for a good story that needs telling. What is your creative process? How do you structure your strips in advance? 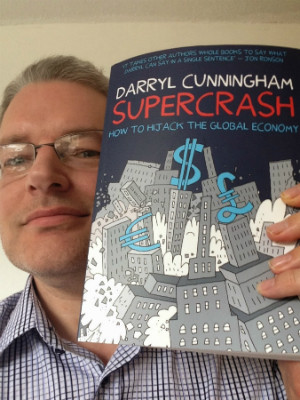 And how much research goes into a page of a book like Supercrash? I read tons of material, both online and in book form. Books get stacked all around my bedroom. I read everything until I know the subject backwards and forwards. When I get to the point where I can explain to someone else the subject in detail, then I conclude that I know it well enough myself. Then I just start drawing it up. I write and draw one page at a time in the order they’ll be read. Once I reach the end I then go back and revise and add sections. There’s no thumbnailing, but there is sometimes a vaguely written outline that helps give shape to the pages as they develop. After completing such a Herculean task with Supercrash what are your plans for the future? What projects can we expect next from Darryl Cunningham? I have lots of ideas, but I’m not going to commit myself to anything until I see what doors Supercrash opens for me. 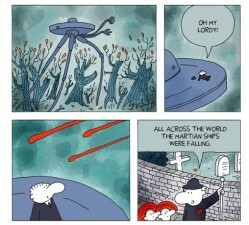 For booking details on the Comica Festival Supercrash event visit the Comica Festival site here. 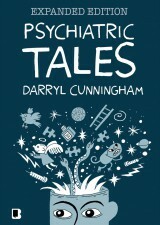 You can find out more about Darryl Cunningham’s work on his blog here. 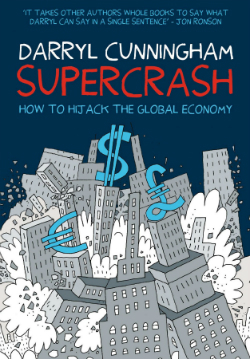 Supercrash: How to Hijack the Global Economy is published by Myriad Editions. Staff Picks for March 15, 2017 – The Facts of Life, American Gods: Shadows, Cadmus, Eartha and More!